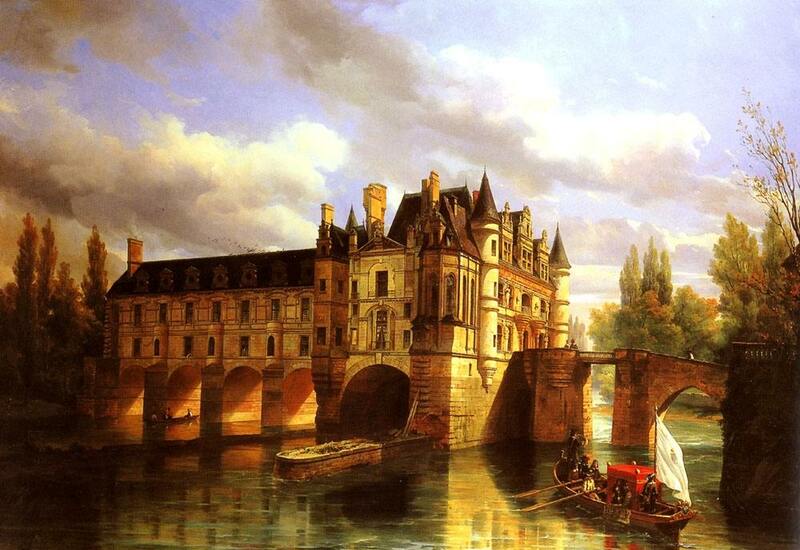 Painting of the Chateau De Chenonceau, 1843, by Pierre Justin Ouvrie. Reality or fairy tale? One would have the right to hesitate, considering the harmony, lightness and supreme distinction of this castle built on waters of a serenity and depth suitable to serve it as a mirror. One would say that this unimaginable façade was made to be seen especially in its reflection in the clear waters it hovers upon. Yes, it is a reality, but a fairy-like reality born of the French genius. 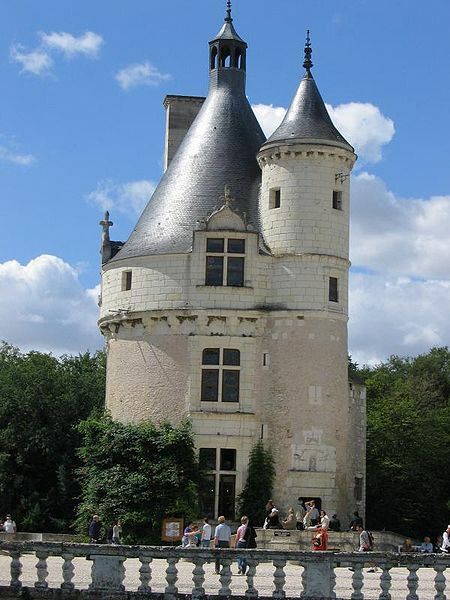 It is the Castle of Chenonceau, built in the sixteenth century. It stands out for a harmonious interpenetration of strength and grace, symmetry and fantasy quite typical of the French soul. The photo sets before us three different elements: a long, uniform building ending by joining a quite different one flanked by small turrets. And finally, to the reader’s right, a heavy tower. The body of the building rests on five arches, whence its lightness. To prevent the arches’ pillars from looking too heavy, each is topped by a ledge made to look like a turret and lightened with a large window. Over the turret, on the upper floor is another window which seems to gracefully end on the mansard’s almost smiling ornamental bull’s eye. Pillar, turret, second floor window, mansard bull’s eye form a sort of ensemble that is entirely reflected in the water producing a kind of continuity between the building and its reflection. Accordingly, the noble and harmonious shape of the arches is also enhanced by its own reflection. And these two elements vigorously ensure aesthetic continuity between the real castle, immersed in diaphanous air, and the unreal castle, “immersed” in the Cher River. The five arches correspond to the five parts of the facade, which repeat one another. The harmony is perfect. So perfect that it would border on monotony if its profound placidity were not harmoniously compensated and enhanced by contrast. Indeed, on firm ground stands the building’s second wing, more massive at its base, in its monumentally square figure, in the somewhat warlike haughtiness of its towers, and ready for action and fight just as its counterpart over the river seems to be ready for parties and peace. Considered in itself it also presents a harmonious contrast between strength and grace. Extreme force is shown in its foundations, the compact part that spans from the river to the first turrets. The first and second floors are lighter, with large windows and poetic towers. The mansards and roof have almost musical freshness, diversity and beauty. 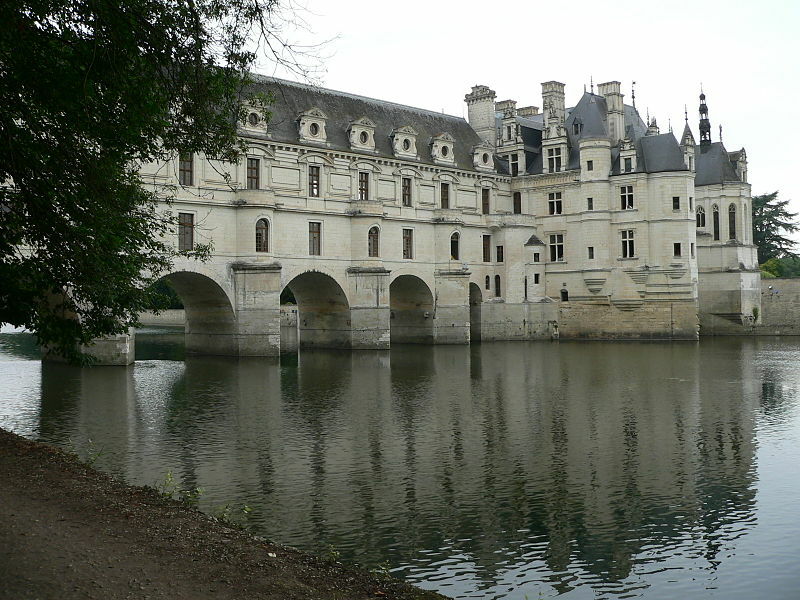 Chateau de Chenonceau, Tour des Marques. 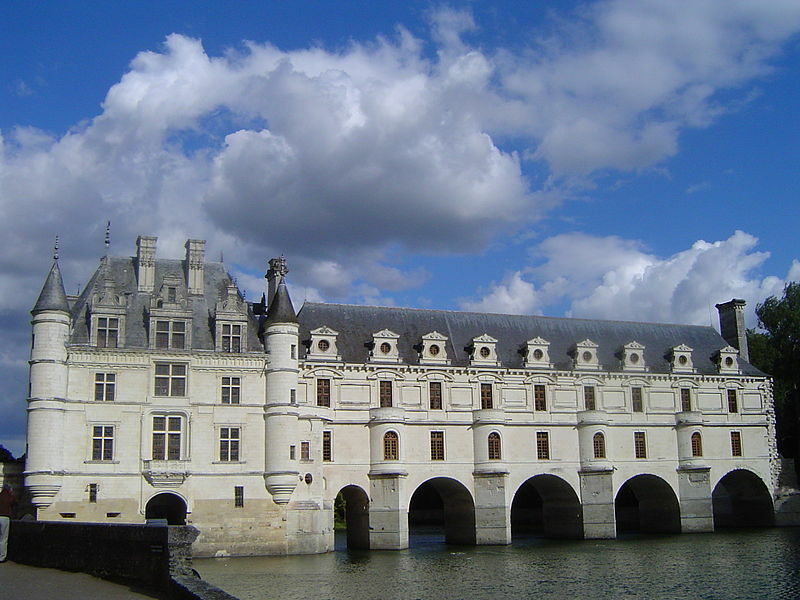 To the left, as a stern and venerable reminder of other eras stands the old tower, heroic, somber, unshaken and bathed in a legendary atmosphere, symbolizing the strength of the traditions that are the soul of Chenonceau. This tower and part of the castle supported by the arches are absolutely heterogeneous. But the central part makes such a smooth transition between them that everything is connected in a nice set. The sixteenth century was a complex time in which paganism (which in the twentieth century culminated with today’s apocalyptic crisis) was already beginning to appear. 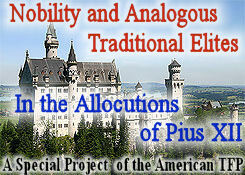 But in which many Christian traditions of distinction, elevation of spirit and harmony of soul still had great vigor. And art itself was still marked by Christian greatness. What did that century do for the poor? What was life like for the servants of this incomparable castle? As a stupid myth has it, a landlord’s luxury was obtained by oppressing his servants. Accordingly, it would be worthwhile to make a photo album depicting so many homes of castle servants which are still preserved. They would serve to dispel that myth. 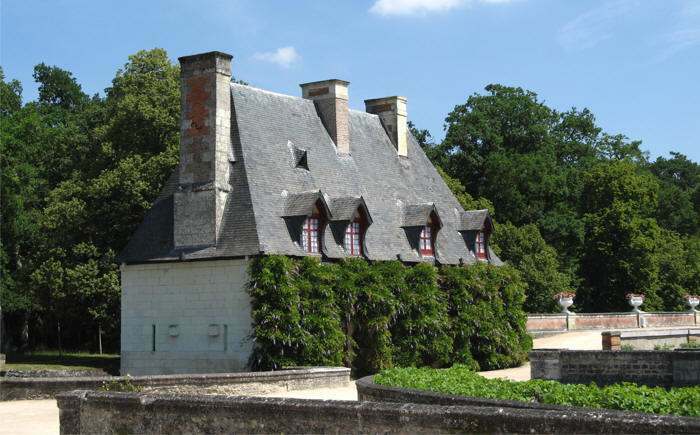 Our second picture shows a sample of such a building in Chenonceau. It was meant for guards. It is a masterpiece of sylvan grace, warmth, unpretentious harmony, authentic picturesque, well suited to warmly protect its dwellers from the weather throughout the winter, with its three chimneys; and forming a delightfully harmonious whole with spring’s festive nature. This is a small aspect of the rural life of yesteryear, which Christian civilization had wisely made so strong, so placid, so stable and so innocent. In the seventeenth century, St. Vincent of Paul, who had high-level relationships in Paris, never agreed to invite his relatives—modest peasants—to change their profession because he figured they had the most favorable living conditions to practice virtue and conquer the Kingdom of Heaven! And no socialism or demagoguery was needed to reach such a pinnacle of rural life.